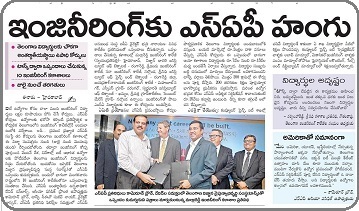 Malla Reddy Group has signed an MoU with TechMahindra, Hyderabad., under this TechM will train our Students recruited by TechMahindra every year will be given in-house training to the students & also conduct FDP program for faculties as per Memorandum of Understanding to this effect. IBM will provide its Technology products and services for training programs. Focus Academy for Career Enhancement (FACE), Chennai to train our final year students.